I Arrived in Malta on Thursday afternoon with Karen plus Mr. Malta himself Pat Currie and Sandra Williams, lovely friends, company and tour guides! After 2 days of visiting various locations around this beautiful island, and surviving slipping on sea weed and smacking my head, it was soon Sunday and race day. After a good breakfast Karen and I went over to catch the athlete’s bus at 7.45am which would take us to the race start at Midena. Pat also came over to the bus with us as he insisted on seeing his athletes safely off! 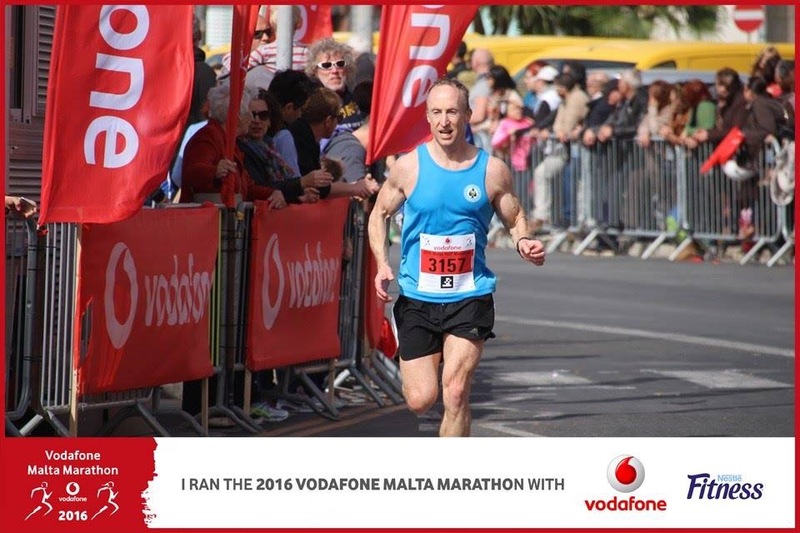 After a 15 minute journey sat in front of some lively Italian runners, we arrive at Mdina. It’s already swarming with runners of various nationalities, and Karen and I begin the first of several toilet queues. The guy on the loud speaker is soon asking for everyone to make their way towards the start line for a prompt 9.15am start. There are no timed pens here; I see 2 pacers holding small balloons with 1.35 and 2.00 hour times written on them in black marker pen! I wish Karen good luck and try to make my way towards the front, but it’s already a solid block of bodies. I remind myself of my master plan for my goal of a sub 1.30 time, a 50/50 negative split of 6.55’s and 6.45’s, but i am also aware that it’s very windy and warm. The starting hooter goes, and it’s a struggle to get going through the mass of people for at least half a mile, I’m nowhere near the pace I need to be and struggle to pick my way through the hundreds of runners. We come to the first downhill; the course map has given a lot of descent so I’m hopeful it stays like this. I’m soon at 6.35’s and my mind is a mix of feeling okay, knowing I’m going too fast, and thinking this pace will make up for the lost time in the crowd. I rein my self back to 6.50’s convincing myself this is a happy medium. I come to the first of the water stops at around 3 miles, i’m feeling the heat and the strong wind is in no way cooling, so have a good slurp and tip the rest over me. The course is now a mix of back streets and dual carriageways, and the first small ascent arrives where the wind really picked up. I’m around target pace at 10k, and the sponge stations were amazing to squeeze water over myself to cool down, a nice idea for a race. At 8.5 miles im really feeling the heat, and there is another slight ascent in a long straight of road, that along with the strong wind sees my pace dropping into the 7’s. I’m praying for the downhill to Selina sea front to come, and my pace goes up slightly when it does, leading down to around a mile and a half of straight run in to the finish. The wind gives a brief respite and comes from behind, and I’m reciting every motivational quote I’ve ever dished out in my head to pick my pace up. The wind comes back round into a headwind and I’m going with everything I’ve got left, and trying to ignore how hot I feel. I can hear the commentator on the loud speaker and am desperately looking for the finish line inflatable but all I can see are restaurant and cafe canopys and banners. I take a last peep at my watch, I can see I’m into 1.30 when i finally spot the finish line and push on with the last bit of energy to cross the line. I collect my medal and grab the usual banana and energy bars and drink, then walk round and see Pat and Sandra who congratulate me, and I blurt out my race story to them! I go to collect my bag with my pre race clothes in and miss Karen coming over the line, she loved the wind as much as I did! We stay and watch for a while, before going back to the apartment to chill, then head back to Mdina but this time for some lunch and a beverage seeing as it was my birthday! Some shopping Monday morning prior to coming home and lunch at Marsaxlokk, a gorgeous traditional fishing village, so Sea Bass and Bream were definitely on the menu for all of us! 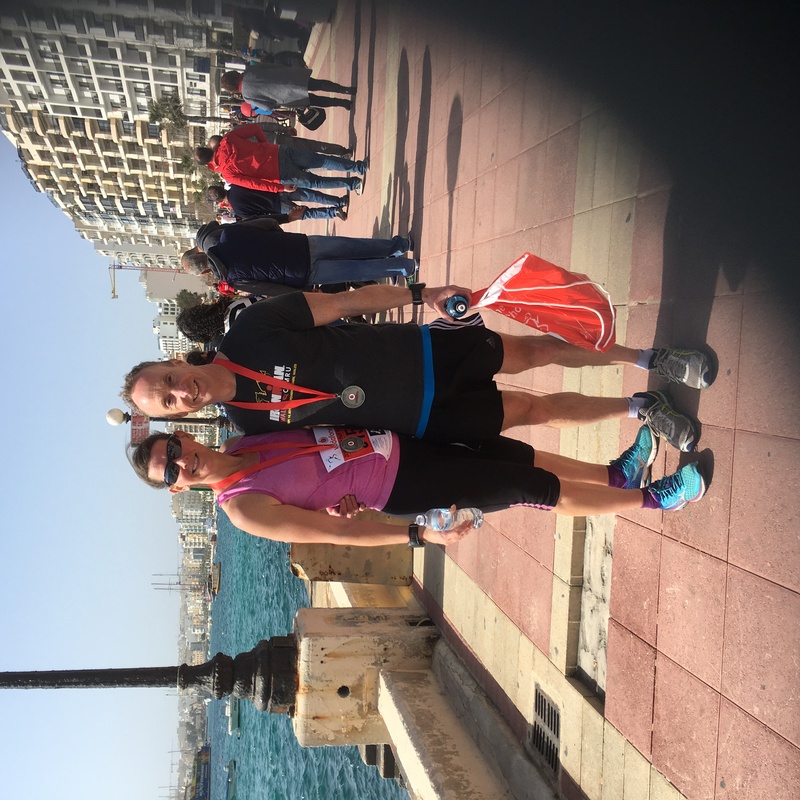 Malta Half Marathon is a brilliant Half to run in, reasonably priced, and a very well organised event, plenty of water and sponge stops with a beauty of a medal at the end. A good course for a PB, just hope the wind is kind to you, and if you can manage a few days to look around this stunning island, all the better. 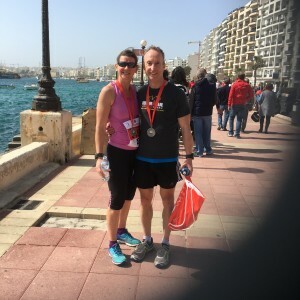 I managed a half marathon PB of 1.30.59, but no sub 1.30 goal cigar……maybe Cardiff Half at the end of March!